RUSH: Samantha Power. Do you know who she is? 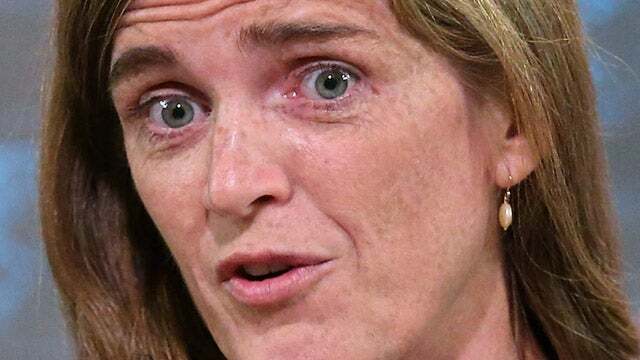 Samantha Power was Obama’s ambassador to the U.N. for four years, from 2013 to 2017. She is the wife of Cass Sunstein, who is the modern-era author of the Constitution being considered “a charter of negative liberties.” This is a lawyer. He’s from the Clinton era at Yale, and part of the sixties counterculture that grew up and acquired power. And charter of negative liberties. They look at the Constitution as “negative” because it tells the government what it can’t do, and that’s not good. Anyway, she’s married to him. She threw a party on election night, a 2016 election night party for 37 female United Nations ambassadors, all of whom expected Hillary Clinton to be elected that night. They expected to witness the first female U.S. president, for whom they would all work in glory and respect. And, of course, what happened, happened; the Samantha Power party ended in despair and destitution and depression and disbelief. She revealed this in a new interview. Do you believe HBO is doing a documentary on the party at Samantha Power’s house on election night? (laughing) “HBO captured the party’s evolution from glee to sadness as part of its new documentary from Greg Barker, ‘The Final Year. '” Ben Rhodes also participated in this documentary. He is the former Obama aide and the brother of David Rhodes, who runs CBS News. Ben Rhodes and Samantha Power are two of the stars — ahem — stars of the film’s behind-the-scenes access to Obama’s last year in office. And that’s what the documentary is. It’s called The Final Year and it contains a scene at Samantha Power’s blown-up party. “Among the invitees were also feminist writer Gloria Steinem and former Secretary of State Madeleine Albright. So confident was Power, she said she was afraid Clinton’s victory would be called too early in the night,” ending the party too soon. “As the host, I was kind of hoping it wouldn’t be quite the blowout that it was anticipated to be, because I wanted to make sure that people had a chance to interact with Gloria Steinem, and one of –” she said. “So, your concern was that actually that the evening was going to be over early,” Glasser said. “Power said she’s haunted by the film catching her then-four-year-old daughter lying like a statue in her mother’s arms as the election is called for Trump.” You see that, she’s standing there with her daughter in her arms and the daughter is said to be lifeless like a statue. Even the four-year-old was shocked and destroyed and she said it triggered “a kind of post-traumatic stress about their own election night experience,” meaning these women. What does this mean? Somebody help me out. She wanted to milk the soft power dividend of this moment. Milk it. She wanted to milk the soft power. This woman is considered a brilliant person by people on the left. She is so enamored of Obama that when she’s in his presence and he’s speaking, she looks like she’s about to faint into unconsciousness. She stands there and she’s got a frown on her face that is meant to be pleasant and I can’t believe I’m in this aura, oh, it is so, it is so wonderful. It’s the most amazing thing that I’ve ever seen. You talk about out of it.